Henry John "Hank" Sauer (March 17, 1917 – August 24, 2001) was a left fielder in Major League Baseball. From 1941 through 1959, Sauer played for the Cincinnati Reds (1941–42, 1945, 1948–49), Chicago Cubs (1949–55), St. Louis Cardinals (1956), New York Giants (1957) and San Francisco Giants (1958–59). He batted and threw right-handed. He and Johnny Bench are the only players in major league history ever to have hit three home runs in a single game twice against the same pitcher. He did it 1950 and 1952 while with the Chicago Cubs, both times against Philadelphia's Curt Simmons. In a 15-season career, Sauer was a .266 hitter with 288 home runs and 876 RBIs in 1399 games. A native of Pittsburgh, Pennsylvania, Sauer started his major league career with the Reds in 1941, and was traded to the Cubs midway through the 1949 season. 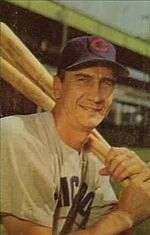 A two-time All-Star, Sauer was a feared slugger for the Cubs in the early 1950s, hitting over 30 home runs in six seasons, with a career-high 41 in 1954. His most productive season came in 1952, when he led the National League in home runs (37) and RBIs (121), and was named the Most Valuable Player. During a time when the Cubs were especially moribund, Sauer provided some joy for the team's fans with his power hitting, earning him the nickname "The Mayor of Wrigley Field". He was well known for using smokeless tobacco, and it has often been reported that after he hit a home run, when he returned to his left field position, bleacher fans might shower him with packets of his favorite chew, Beech Nut tobacco. In 1955, Sauer tried to hold out for a bigger contract for the Cubs, but was released. A year later, he played with the Cardinals and finished with the Giants in 1959. Sauer died of a heart attack while playing golf in Burlingame, California at age of 84.